Guys, I’ve been having the BEST time camping. We’ve been going off the grid, sans internet and it has been wonderful. I never knew how addicted I was to my phone. Okay, who am I kidding, I definitely knew, and I needed an intervention. 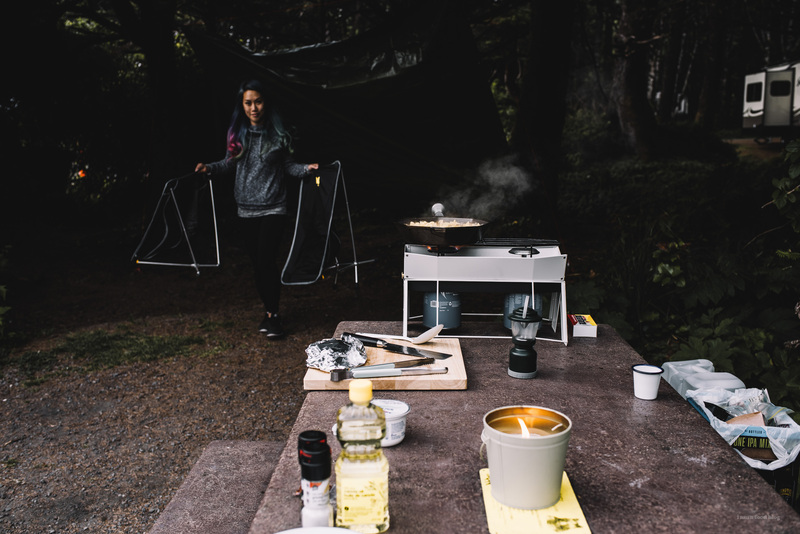 Camping along the Pacific Northwest coast has been the sweetest intervention ever. 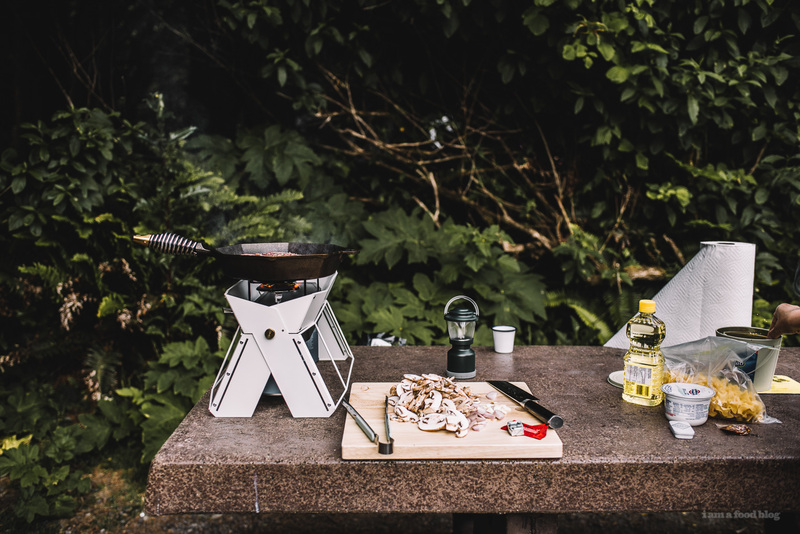 Early nights with daily fires, early mornings with camp pour over, and cooking outdoors equal dreams come true. 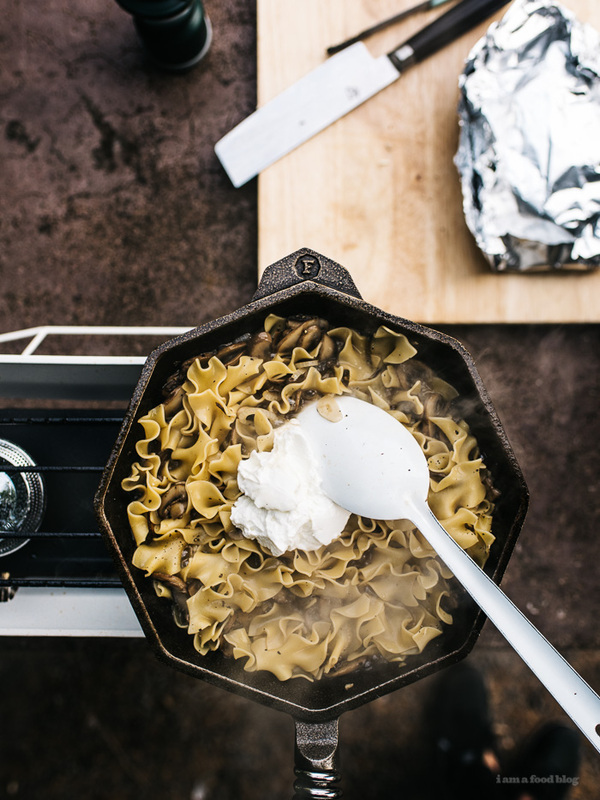 This camp beef stroganoff was the very first thing I cooked at camp and it was delicious, although there was a tiny little mishap along the way. We arrived at camp in the early afternoon after driving through intermittent showers. I definitely knew that rain was in the forecast – we were in the Pacific Northwest after all, but I breathed a sigh of relief that we didn’t have to set up in it. After putting up our tent I wanted to start cooking right away but Mike told me in a very firm, but friendly manner that I should have a snack. 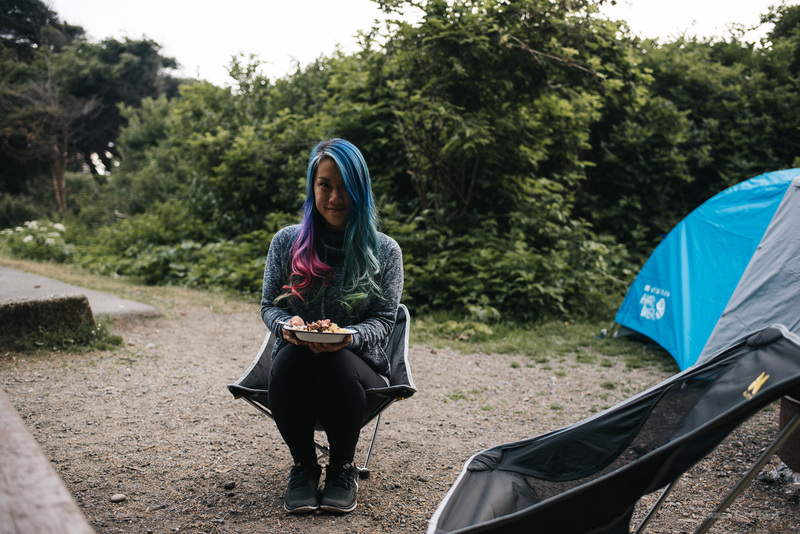 It was true, I was starting to get hangry so instead of cooking, we sat down in our camp chairs and I dug into a giant bag of cuttlefish snack (which by the way, to my consternation, are harder and harder to find these days) while Mike had a beer. We were chatting away, not facing our picnic table, when out of the corner of my eye I saw a black crow swoop down to attach the pre-portioned bag of egg noodles I packed. I rushed towards him and scared him away, but lesson learned: the crows are hungry, even for dried pasta! I took it as a sign and decided to get cooking so we could eat, instead of the crows. 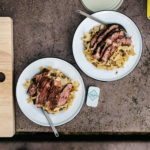 Beef stroganoff was one of the first camp cooking ideas Mike and I came up with. I wanted to do it with ground beef a la Hamburger Helper style, because I have a love-love relationship with ground beef and I didn’t really want to stew meat for a long time because of fuel consumption. Mike axed the idea pretty early because he thought there would be an issue with keeping ground beef cold. But now that I think about it, we bought it on that day and it was on ice. I’m pretty sure it would have been okay. But, in the end we went with steak and I’m glad we did! 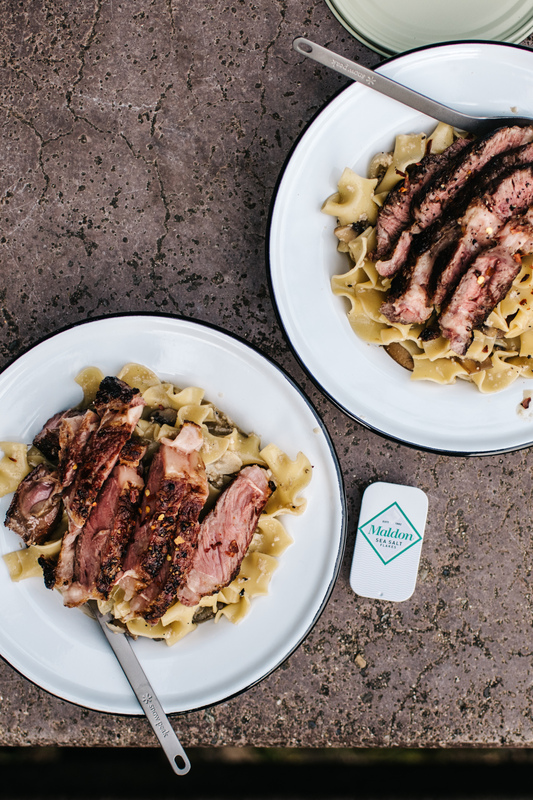 The smell of steak searing in the open air is not to be missed! This one pot pasta came out both better and a little worse than I thought it would. Better because the steak was awesome. Worse because I added in the yogurt too quickly and the sauce broke due to the residual heat from the pan. 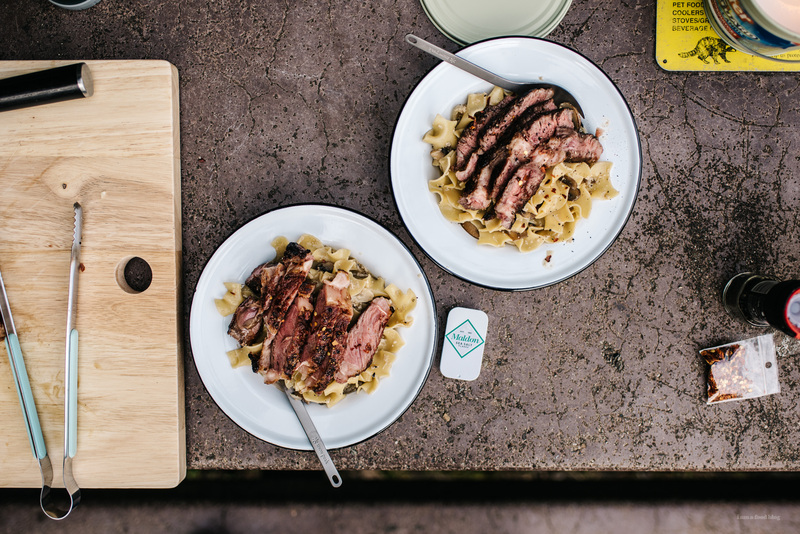 But, a broken sauce isn’t the end of the world, especially when camping. And if you’re just a little more patient than me, you’ll have an out of this world camp meal! Pat the steak dry with paper towels and season both sides generously with salt and freshly ground pepper. 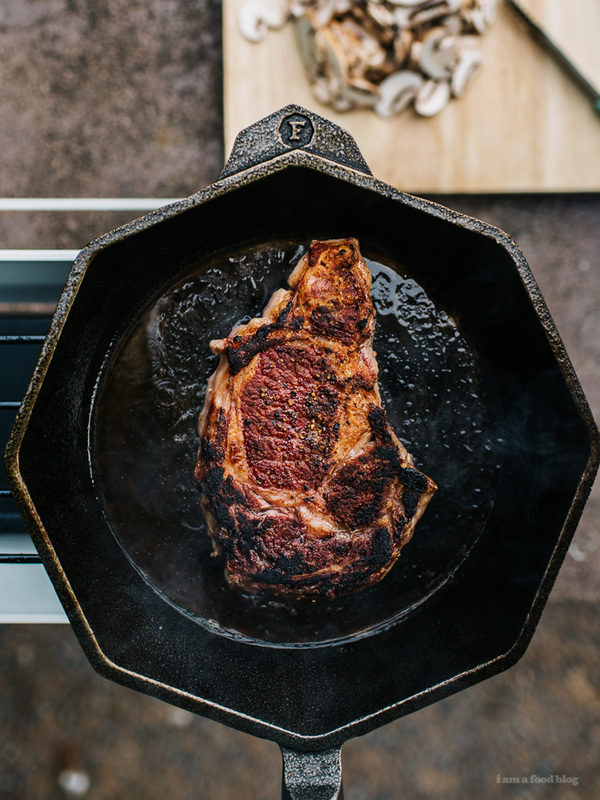 Heat a cast iron pan on high until nearly smoking. Add a tiny slick of oil and place your steak in the middle of the pan and cook, without moving for 2-4 minutes. Flip and cook for another 2-3 minutes. (Or cook to desired doneness.) Remove from the pan and let rest while you cook the noodles. Heat up a touch of oil over medium high heat. Brown the mushrooms and onions, letting the mushrooms sear before stirring. When browned, add the water and stir in the soy sauce and bouillon cube, making sure to dissolve. Bring to a boil and add the noodles and cook until tender and most of the liquid evaporates, about 6-8 minutes, or according to the package. Remove from the heat. Slice the steak against the grain. Temper the yogurt or sour cream with a bit of sauce and then stir in. Divide evenly among two dishes, top with the sliced steak, salt and pepper to taste, and red pepper flakes if desired. Enjoy! Note: My Greek yogurt broke and curdled because I was impatient and stirred it into boiling sauce. Don’t be like me – temper your yogurt or sour cream with a bit of the sauce first, then add it in when your pasta is off the heat! Also, if you want to cut up your steak and stir it in as most other beef stroganoffs do, feel free! The soy sauce is optional. I feel like it adds an extra bit of umami oomph with the mushrooms, but if you don’t have any soy sauce packets on hand (which is what I used! ), you can skip it. I am loving your camping posts! So awesome! 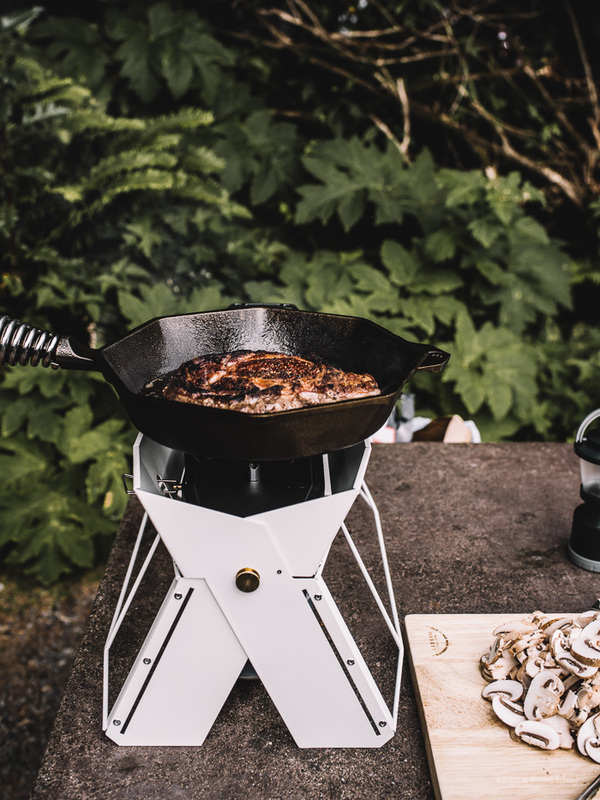 Love this, I am always looking for ways to make gourmet camp meals! My camping buddies tend to think I am crazy for overcomplicating things but I love the challenge of making something fancy outdoors. 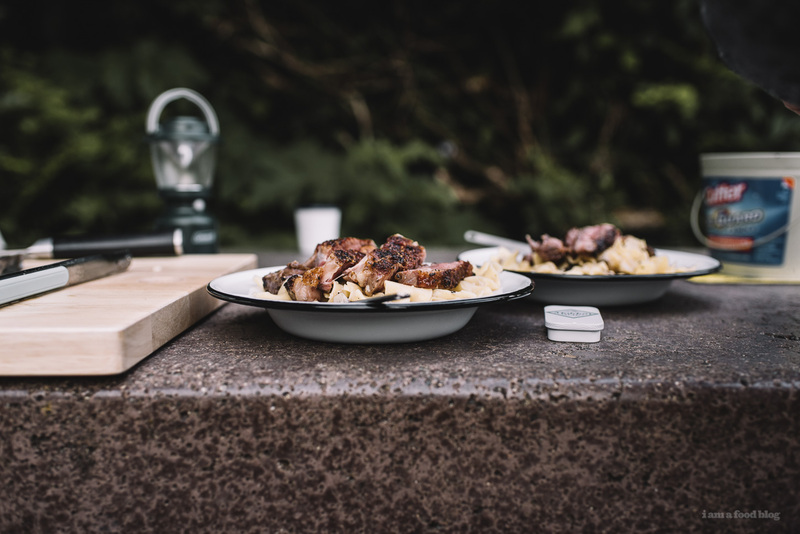 Please continue to share your camping meal ideas! First of all, I love your hair. Second of all, what amazing pictures! I love the one with the stroganoff on the grill and you carrying the chairs behind. It feels like I’m right there with you! (In the least creepy way :P) I’m going camping soon and can’t wait to try this recipe! 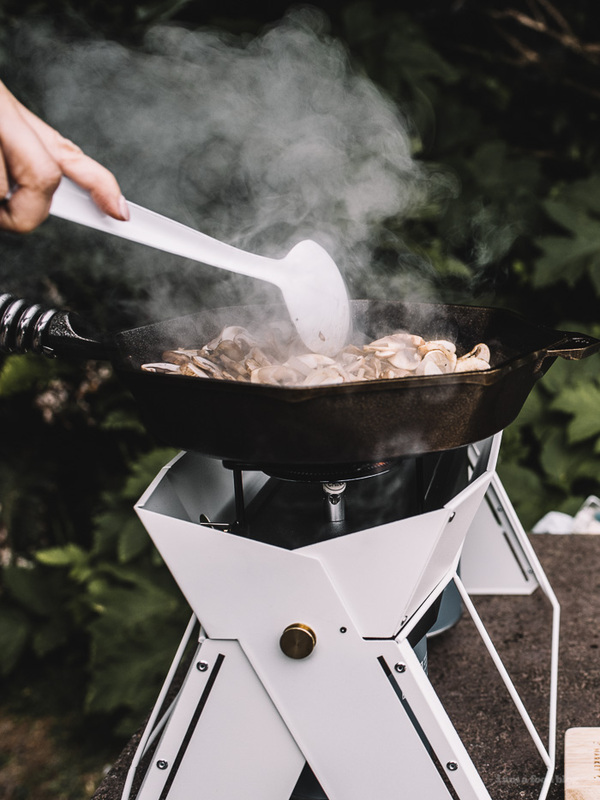 I have a million heart eyes for your camp stove, seriously. I have never cooked anything this good while camping! I’m definitely inspired for my next camping trip. Thanks for sharing! this looks awesome! one thing though…I see there’s an onion in your ingredient list, but I don’t see it in your instructions? did you just saute it along with the mushrooms? hi lauren, yes add them with the mushrooms! i’ve corrected the recipe. thanks for the heads up! 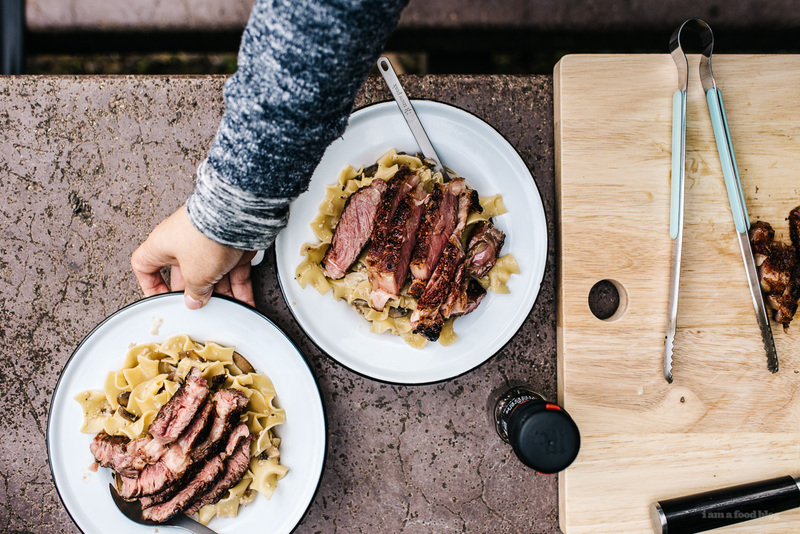 I came here looking for tips on making a camp-friendly stroganoff, so thank you for that. Then I was inspired to comment because I love your hair! Nothing wrong with looking good in the wilderness. Hi this looks great. I wanted to cook it at home and make it for three people. I wondered if I could possibly cook the sauce and mushrooms in a dutch oven then add the pasta. Would I just doublet the water, bullion and pasta? yes, that would absolutely work :) don’t forget to temper your yogurt or sour cream before adding it so it doesn’t break in the sauce – there’s a note at the very end of the recipe that talks about it.